Dr. Kerry Burkley became the 8th pastor of the Greater Ebenezer Baptist Church of Waco in 2005. 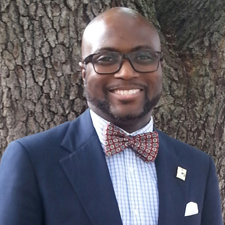 He has served as associate pastor at South Union Missionary Baptist of Marlin, Seventh and James (Waco), and as Youth Pastor of Antioch Missionary Baptist (Waco). Pastor Burkley is the director of the Ministers In Training and Academy for Lay Ministry Certificate Programs of Greater Ebenezer. These programs teach curriculum to equip, train and educate men and women who are called to the preaching ministry and lay ministry. The purpose is to provide holistic ministry training, personal development in the African-American church through dialogue and vigorous study that couples academic excellence with a high degree of social consciousness that reaches outside the walls of the church and into the often neglected community. Dr. Burkley is the Program Director of the Children's Advocacy Center of the Advocacy Center for Crime Victims and Children. For the past 14 years, he has been involved with a collaboration of Law Enforcement, District Attorneys, Children's Protection Services, and the Medical community concerning the investigation of serious child sexual and physical abuse in four counties. He is a trained Forensic Interviewer and member of the Children's Advocacy Center's of Texas Professional Society of Forensic Interviewers where he is on the front end of child abuse investigations. Dr. Burkley holds the Doctor of Ministry and the Master of Divinity degrees from Truett Seminary. Dr. Burkley enjoys cooking, specifically grilling, and spending time with his wife Doyce who is a student at Truett Seminary and his three children.